Once every three years the International Monetary Fund and the World Bank hold their annual meetings out of town. Instead of schlepping over to Washington, the gathering of finance ministers and central bank governors is hosted by a member state. Ever since the 2000 meeting in Prague was besieged by anti-globalisation rioters, the away fixtures have tended to be held in places that are hard to get to or where the regime tends to take a dim view of protest: Singapore, Turkey, Peru. This years meeting will take place in a couple of weeks on the Indonesian island of Bali, where the IMF and the World Bank can be reasonably confident that the meetings will not be disrupted. At least not from the outside. The real threat no longer comes from balaclava-wearing anarchists throwing Molotov cocktails but from within. Donald Trump is now the one throwing the petrol bombs and for multilateral organisations like the IMF and World Bank, that poses a much bigger threat. The US president put it this way in his speech to the United Nations on Tuesday: We reject the ideology of globalism and we embrace the doctrine of patriotism. For decades, the message from the IMF has been that breaking down the barriers to trade, allowing capital to move unhindered across borders and constraining the ability of governments to regulate multinational corporations was the way to prosperity. Now the most powerful man on the planet is saying something different: that the only way to remedy the economic and social ills caused by globalisation is through the nation state. Trumps speech was mocked by fellow world leaders, but the truth is that hes not a lone voice. The worlds other big economic superpower China has never given up on the nation state. 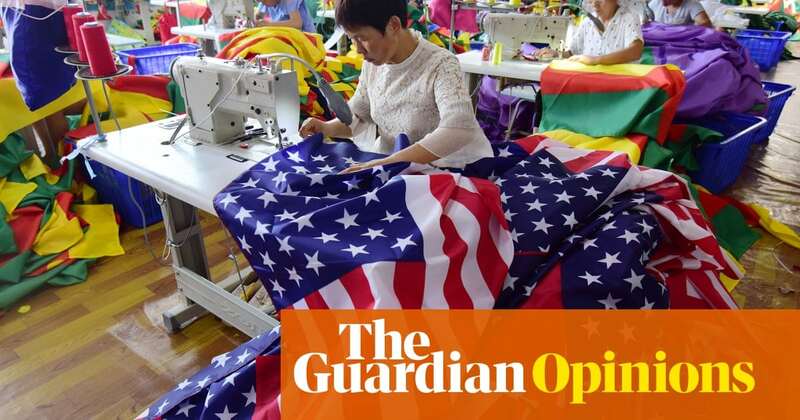 Xi Jinping likes to use the language of globalisation to make a contrast with Trumps protectionism, but the stupendous growth posted by China over the past four decades has been the result of doing the opposite of what the globalisation textbooks recommend. The measures traditionally frowned upon by the IMF state-run industries, subsidies, capital controls have been central to Beijings managed capitalism. China has certainly not closed itself off from the global economy but has engaged on its own terms. When the communist regime wanted to move people out of the fields and into factories it did so through the mechanism of an undervalued currency, which made Chinese exports highly competitive. When the party decided that it wanted to move into more sophisticated, higher-tech manufacturing, it insisted that foreign companies wishing to invest in China share their intellectual property. This sort of approach isnt new. It was the way most western countries operated in the decades after the second world war, when capital controls, managed immigration and a cautious approach to removing trade barriers were seen as necessary if governments were to meet public demands for full employment and rising living standards. The US and the EU now say that China is not playing fair because it has been prospering with an economic strategy that is supposed not to work. There is some irony in this. The idea that the nation state would wither away was based on three separate arguments. The first was that the barriers to the global free movement of goods, services, people and money were economically inefficient and that removing them would lead to higher levels of growth. This has not been the case. Growth has been weaker and less evenly shared. The second was that governments couldnt resist globalisation even if they wanted to. This was broadly the view once adopted by Bill Clinton and Tony Blair, and now kept alive by Emmanuel Macron. The message to displaced workers was that the power of the market was rather like a hurricane or a blizzard an irresistible force of nature. This has always been a dubious argument because there is no such thing as a pure free market. Globalisation has been shaped by political decisions, which for the past four decades have favoured the interests of capital over labour. Finally, it was argued that the trans-national nature of modern capitalism made the nation state obsolete. Put simply, if economics was increasingly global then politics had to go global, too. There is clearly something in this because financial markets impose constraints on individual governments and it would be preferable for there to be a form of global governance pushing for stability and prosperity for all. The problem is that to the extent such an institutional mechanism exists, it has been captured by the globalists. That is as true of the EU as it is of the IMF. So while the nation state is far from perfect, it is where an alternative to the current failed model will inevitably begin. Increasingly, voters are looking to the one form of government where they do have a say to provide economic security. And if the mainstream parties are not prepared to offer what these voters want a decently paid job, properly funded public services and controls on immigration then they will look elsewhere for parties or movements that will. This has proved to be a particular problem for the parties of the centre left the Democrats in the US, New Labour in Britain, the SDP in Germany that signed up to the idea that globalisation was an unstoppable force. Jeremy Corbyn certainly does not accept the idea that the state is obsolete as an economic actor. The plan is to build a different sort of economy from the bottom up locally and nationally. Thats not going to be easy but beats the current, failed, top-down approach.